Ask a… Small Group leader! In our last post, Dennis shared about returning to Beijing. If you missed that post, you can read about it here. This week, we will hear from Greg and Lisa Hopton on what it is like leading a Small Group. Tell us about your current Small Group! What does a typical gathering look like? Lisa: Our Small Group has been ever-changing over the years with so many coming and going from Beijing. However, currently we have foreigners and also a lot of “returnees” – or Beijingers who have lived abroad. They are not going anywhere, so our group has been consistent these past few years. We have had to move apartments three times, but our members follow us no matter where we are. Most are young and single. Greg: Each week we start with a meal and fellowship time. Then we have our Bible study time followed by sharing prayer requests. They all enjoy seeing each other each week and show a strong desire for learning about the Bible and how to apply it to their daily lives. Our Bible studies typically alternate between various books of the Bible and topical studies, with selected individuals from the group leading the study discussion each week. It sounds like you have established a great rhythm. You must have been leading a Small Group for quite a while. Lisa: We have been hosting and leading our Small Group for 6 years. That’s our entire time in Beijing! I consider myself to be the host, and Greg has been the leader. I also have led other small groups over the years, such as in Women’s Ministries. Greg: Both Lisa and I feel blessed to part of this ever-changing Small Group since 2012. Amazing! Tell us more about how leading Small Group blesses you. Lisa: To know that we can, in some way, help others to learn and grow in their faith is rewarding. We see that these people are hungry for the Word and Christian fellowship. I am honored to be able to open my home and “feed” those who enter in. Greg: It is truly rewarding to see spiritual growth of individuals over the years. Some attend the group without having any understanding of Christianity, while others are mature Christians that can share key insights on how to live a Spirit-led life. Even though many people have transitioned through the Small Group over the years, we have formed many lasting friendships that are Christ-centered. I’m sure some of it must be challenging though. What part do you struggle the most with? Lisa: Sometimes I feel burned out hosting week after week. But God gives me everything I need to serve Him in this way. And our Small Group members bring me great joy! Greg: I struggle with my required business travel that results in me missing the Small Group from time to time. The positive outcome of my absence is that it has created several very effective group leaders. I love when we see God redeeming those parts of serving we struggle with the most. You mentioned you have been leading Small Group in Beijing for six years. Have you ever led Small Group in a different city or country? How does leading in Beijing compare? Lisa: Yes. We have hosted and led Small Group back in our home church in the U.S. It is something we feel is important to be involved in. Back home, people have so many distractions in life keeping them from being committed to attending a Small Group. We have found quite the opposite in Beijing. The people here want this, and they make it a priority to come! Greg: We have found that the members look forward to the fellowship each week despite long commutes and long work days. I am very encouraged by the level of commitment of our members. Many Christians attending church in Beijing emphasize the importance of “getting plugged in” to community and credit their Small Groups as being essential to life here. Can you elaborate on the importance of being a part of a Small Group while living in Beijing? Lisa: A Small Group becomes your family. These are the people who support and help you in times of need when your real family is far away. As Christians we need to surround ourselves with other believers to keep us accountable. We need Bible study to keep learning and growing in our relationship with God. Greg: The various Small Groups play a critical role to the growth of City Church. Our Small Group provides the personal connection that cannot be created only on Sunday mornings. With personal connections in a Small Group setting, we can offer the required support and encouragement. Some common understandings of leading a Small Group are that you have to be extremely outgoing, know the answers to all of the questions, and be a fantastic cook. What can you say about these assumptions? Lisa: While all those things are nice, they certainly are not necessary for leading a Small Group. I am an introvert, but God has brought outgoing members to our group! I struggle to understand the meaning of Scriptures, but together we can try to make sense of it. Believe or not, I do not really like cooking, but they always seem to love whatever simple dish of Western food I make. And many times we order pizza. Greg: I believe that the main requirement to be an effective Small Group leader is the desire to want to see others personally connect with each other while introducing biblical principles to encourage a stronger spiritual growth in our relationship with God. God can use each of us to strengthen our Small Groups. What are other common misconceptions people might have about being a Small Group leader? Lisa: You may think you need a nice apartment or a big apartment. Sure, a big apartment is helpful if you have a larger group, but people do not mind sitting on the floor. The most important factor is that you are willing to open your home. God will work out all the details! Greg: To be an effective Small Group leader, one does not have to be a Bible scholar. I like to identify facilitators to lead the weekly discussions – not experts. As a Small Group, we explore together what the Scriptures say and practical ways that we can deploy the Scriptures. I’m sure that is very reassuring for some of our readers who might be considering hosting or leading a Small Group. What other advice would you offer them? Greg: To be effective, the same person should not try to both host and lead a Small Group. It is important to get all the members involved in the Small Group – empower others to feel ownership in the group. Develop co-leaders to take leadership roles. This will keep the Small Group fresh and inviting to others. Finally, what are some of your most favourite memories leading Small Group? Lisa: I love it when our members invite others to our group and when these friends are not yet believers. One of these guests attended for a few months before returning to his home country. During that time, each week at Small Group we had a member share their testimony on how they became a Christian. We were trying to encourage everyone to think about their story, so they can share their faith with others. Those weekly testimonies had such an impact on this young man that he soon was seeking to know more about God and anxious to find a group fellowship back home. 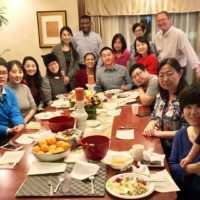 Greg: One member felt such a connection with our Small Group that he wanted to do his marriage proposal to his girlfriend, who was also a group member, during our Small Group meeting. He felt strongly about proposing during a meeting due to the personal involvement that each of our Small Group members had in their relationship. Of course, everyone in the Group was overjoyed and honored to be a part of this special event. What a beautiful picture of how a Small Group really becomes your family! Well, Greg and Lisa, thank you so much for sharing with us today. I am sure you have inspired many readers to lead or host a Small Group—or perhaps join one if they have not yet!